Converts one SAE into two SAE's. Great for Luggage Electrix™ or for powering two heated vests from one SAE battery lead. 6" long. 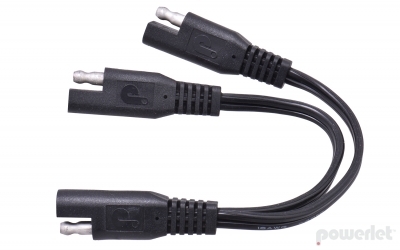 Most commonly used inside luggage as part of the Luggage Electrix system, these cables were also designed to convert common battery charging SAE leads into useful outlets for charging cell phones, powering GPS units, etc. Carry a PAC-024-06 in your tool kit to quickly convert your Battery Tender(tm) lead into a cell phone charging socket. Patented. Ideal for powering cell phones, GPS units, radar detectors, satellite radios, air compressors and other electrical gadgets. These cables are used inside your luggage to provide a combination of outlets that best serves your needs. Built with touring riders and commuters in mind, Powerlet simplifies what to do with excess cords around the handlebars. For example, the excess GPS power cord can stay inside your tankbag while the GPS is mounted to your handlebars. The Luggage Electrix system is designed to help quickly hide expensive electronics when we step away from our bikes. Since the GPS or Radar Detector is plugged in inside the luggage there is no need to unplug it every time you stop for gas, food or to stretch. Remove the electronics from its mount and place it inside the luggage, there is no need to unplug the gadget every time you stop.